Consultants have debated the process or content issue for as long as I can remember. Some people think you can be a purely process consultant. For instance, you can be a strategy consultant and hop from one industry to another. It’s as easy as changing the account number on your expense report. Still another group of consultants poo poo process and think it is all about content. Other people think you can specialize in a single industry and offer both content and process.The debate hasn’t been resolved and I suspect it will go on for a few more decades. Personally, I think it is important to start with the process and add in a serious amount of content. The consulting world has changed in the last two decades. The changes have been brought on primarily by the internet and Analytics. You can read about the changes in a recent HBR article by Clayton Christianson et al. The article is titled, Consulting on the Cusp of Disruption. The “content” work that junior consulting staff used to do is now being done by predictive models and software. Analytics has become a major industry in itself. Companies have their own Analytic engines to gather data and compile it. The demand for data apes has collapsed. The specialty of Benchmarking is a good example of how things have changed. Not long ago there armies of junior consultants putting together data on industry costs, executive salaries, profit, etc. Often it was done for a CEO who wanted to show his/her board how well things were going or how uncompetititve his compensation package was. Now any CEO or HR executive with a laptop and a credit card can benchmark just about anything in an hour or less — globally. There is still need for people who are skilled in working with numbers and presenting the results in clear, concise ways. There will still be a strong need for professional process consultants. Companies will still need help choosing the right process and using tools like business models. They will also need professional facilitation. And, most companies will welcome specialized help in managing strategy projects. Content consulting is shrinking. 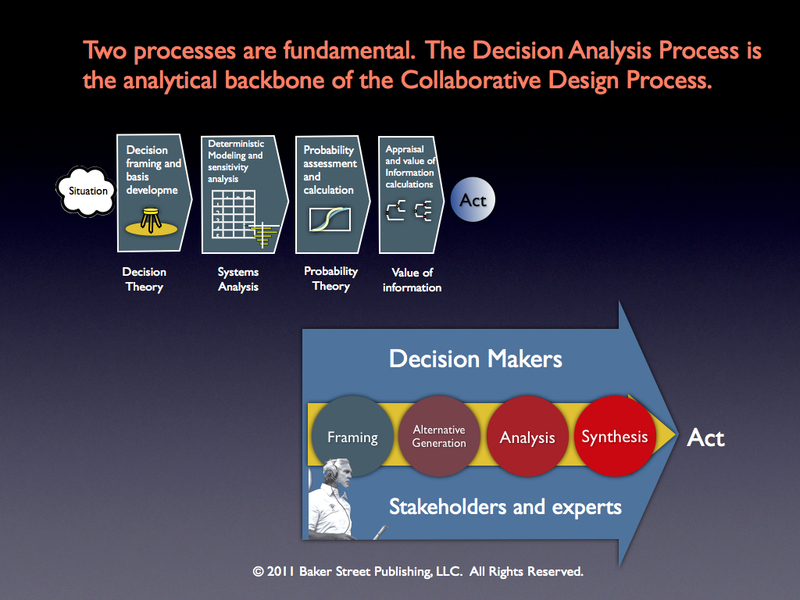 At the same time, decision engineering is a growing profession. (My thoughts on this professional role are summarized in a recent blog post, What is a Decision Engineer?) An organization has been created to promote the profession, The Society of Decision Professionals. The Society has about 1000 members. 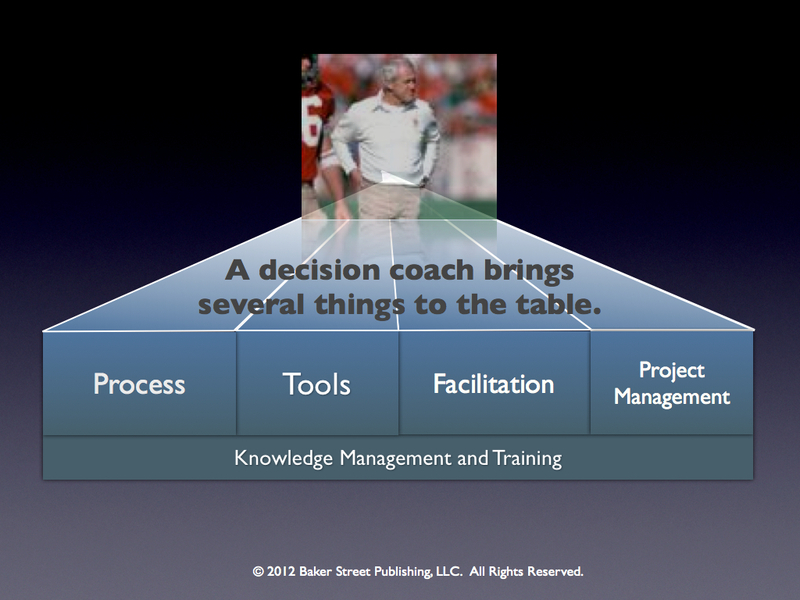 I think the future is bright for decision coaching. I believe more clients want their consultants to teach them how to fish. They are not happy just being fed fish that were caught somewhere else. 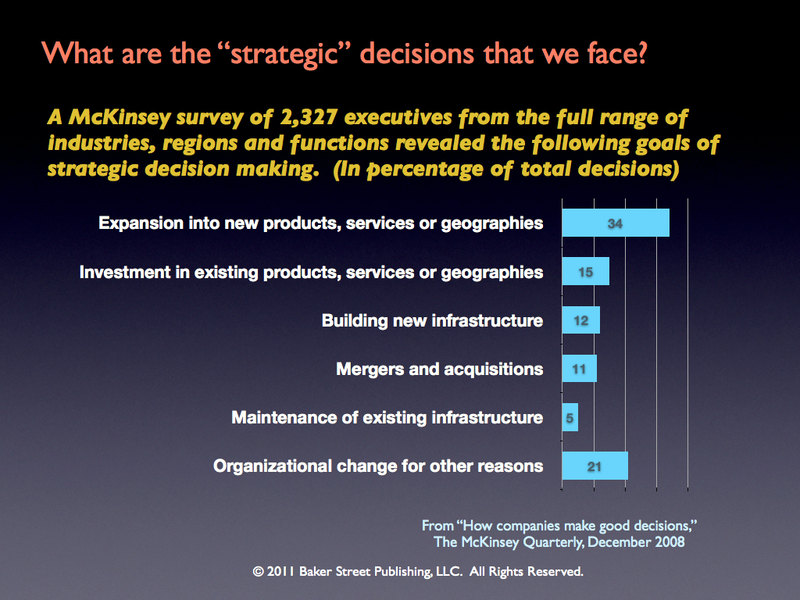 Large companies are developing their own decision coaching capabilities. Many already have in oil and gas, pharmaceuticals, and automotive. Smaller companies will continue to bring decision coaches in from outside. One experienced decision coach can lead a team of executives and their staff toward a good decision with buy-in. Big strategic decisions tend to be episodic. Most smaller companies don’t have enough work to keep an experienced, qualified decision coach on the payroll. Process or content? There is obviously a need for both. With new technology more companies are able to do content for themselves. As for process, most companies will demand to know what the consultant is doing, i.e., what process are they using? And further, they will want to learn how to use the process themselves. If you work in an organization, ask your strategy consultant what process they are using. Ask them how it compares to the decision analysis process. Or, the Collaborative Design Process. Ask them how they determine if their projects are framed properly. Please let me know what they say.